Let’s talk a little bit about Instagram for a sec. More and more moms are using Instagram to search for all the things they need. Dresses? Bows? A romper for your daughter? A vintage suspender set for your son? It’s ALL on the gram. (The best part is that when you search, you can find all kinds of small businesses run by mamas!) That’s a topic for another day, but Instagram is also the perfect place to find your photographer! If you search for Houston Newborn Photographer, guess who you’ll find? Yep, this girl! It was tough work getting there, but it worked out SO well! Skye (maybe you remember her from this maternity session) was one of the first mamas who contacted me from Instagram! Let me tell you– the IG gods were totally in my favor that day, because she is such a gem and I have truly loved getting to know her and meeting her beautiful baby girl! The best part– she surprised me today with a beautiful blog about her experience with me! Have you heard of the children’s book That’s Good! That’s Bad by Margery Cuyler? As a teacher I loved it! Everything good thing is spinned in a bad way, or vice versa. Anyway– here’s the thing. When you have a bigger than average newborn, everyone immediately thinks of the poor mama and in their head says “oh, that’s bad.” But– take your 9 pound 9 ounce newborn to a photographer and she will say “No, that’s GOOD!” Those newborns over about 8.5 pounds have already established their arm roll and cheek game, y’all! And do you know what I love… CHEEKS… and any kind of roll! So, I’ll stop chatting and introduce you all to the cutest cheeky girl there is! If you didn’t read it before, you have to go check out Skye’s blog about her newborn session! She gave a fantastic “behind the scenes” look of a shoot with me! Interested in booking your own newborn session? Let’s chat! I am a Houston newborn photographer with a studio for maternity, newborn and baby photography in The Woodlands area. I look forward to helping with all of your portrait needs! Pop quiz! What’s my favorite thing to shoot? YEP. It’s twins! Twin newborn photography in Houston is just about the most adorable thing. I know everyone thinks twins are precious and of course I’m no different! Anytime a mama e-mails me about a twin newborn session I get so excited! I don’t even know what it is, they’re just undeniably the cutest little things on the planet! I’m sure their parents are 110% more exhausted than others but you’d never know it by looking at these sweet new parents! Close to the time of your newborn session, I will send out a questionnaire that helps me know what to focus on during your session. The biggest question for me with twins is one that parents really need to think about! When you are hanging your portraits, do you want to hang mostly portraits of them together? Or do your prefer them to be separate? Or equal mix of both? If it were me, I think I’d want to hang a large portrait of the babies together, with an individual portrait of each baby on either side. Maybe something like this! Typically, my newborn sessions are done between day 6 and 10 after birth. Sometimes, when twins come early, they spend some time in the NICU which pushes back our session a little bit. These babies are here to prove that is no big deal, especially when babies are early! These angels were about 6 weeks for their newborn session and they ROCKED it! 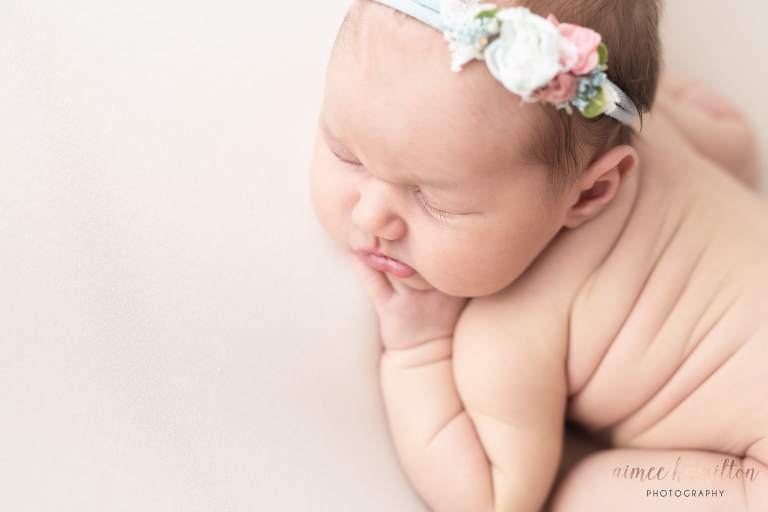 Aimee Hamilton is a Houston newborn photographer with a light and airy studio just north of The Woodlands, TX. AHP offers both studio & in-home lifestyle portraits. For more details about newborn and baby’s first year plans, click here! Big News for Newborn Photography in The Woodlands! I’ve been holding out on you guys and keeping a really big secret. You see, I wanted to have the keys in my hand and be officially moved in before I made any announcements. If you follow my social media pages, you may have seen me spill the beans! I, Aimee Hamilton Photography, just opened a brand new studio for newborn photography in The Woodlands, TX. You guys, it is just so perfect. The new studio features white walls, gorgeous natural light, and soft textures. I’ve still got a few finishing touches that I’d like to work on, but I can’t wait to get a tour of the studio on the new blog! Can I get a drum roll please?! I hope you all are just as excited as I am to see the first newborn session in the new studio! I am really excited about how beautifully these turned out. I went with white walls for a classic, light and airy look. Book your Newborn Session Early! One question that I get asked a lot is when to book. The answer is to plan ahead! I’m a wife and a mama of 3 first. I fill my calendar up to the max, but sometimes I still have to say I’m full. The best time to book is during your second trimester! Looking for more details? Head over to my newborn page for the latest details! Y’all, I am so excited to invite you to my new Houston photograph studio, just a few minutes north of The Woodlands. This is definitely going to be a fun event that you don’t want to miss! There will be shopping, door prizes, and of course, a fantastic giveaway. My new studio is about 10 minutes north of The Woodlands. I am off of FM1488, just past FM 2978. From I-45 or the Woodlands, drive west on FM 1488 just past Tamina Road. The studio will be on the left, next door to CrossFit Magnolia. The Grand Opening of the new studio will be on April 6, 2019 from 10-12. It is a casual come and go event with a couple door prizes, AWESOME giveaways, a discount or two, a little shopping, and of course some yummy snacks! The GRAND Prize Giveaway: A complete baby plan! (Maternity, Mini-Newborn, & Cakesmash collection.) Trust me when I say, this is a once in a life time opportunity! Feel Free to RSVP to the Facebook event for updated details! I have also invited a couple friends to come out for a little pop up shop! Each of these amazing women will have great things for you! Drop by as you can, say hello, grab a snack, and enter the giveaways! I can’t wait to see you all there! For more events with AHP, see below! As a new mom (again!) myself, when I booked my own newborn session, the first thing I wondered, was how is this going to flow? What will this look like as far as scheduling, so I thought I’d share this with you to help ease your minds and plan for your session! Sweet baby Kinsley came to me in February, just after my maternity leave. She had the honor of being my very first full newborn session after leave. She was so good to me! I don’t think we ever heard a peep from her at all! She arrived to my newborn studio with her mom while Dad and big brother stayed home until their turn. If you’re able to make that work, it is so much easier on siblings, to arrive about an hour after your session starts. Waiting just isn’t a toddler’s favorite activity! Did you know that these sweet poses are done on top of a bean bag? The bag never shows, so sometimes that comes as a surprise! I start every session on my beanbag while your sweet baby is still full from a good meal. I layer soft, neutral toned fabric and my secret weapon on top of my bean bag. Then, I use bean shaped pillows to help me pose babies into the curly poses that I know you all love so much! If I had to choose, I’d say that the bean bag poses are my favorite portraits of newborns by themselves! There’s just something about the organic nature of the fabric poses is just so sweet! Prop poses are almost every baby’s favorite thing! After we finish the fabric poses, I wrap up your sweet baby and they are typically just as happy as can be! I wrap them in layers so that I can just unwrap as needed and lay them into their next pose. Babies are wrapped for props, and the flokati. After about an hour, Dad and big brother arrived for their time in the spotlight. I do my best to start with siblings if they’re into it, but sometimes they like mom or dad to go first! I love for this portion to be playful and fun! I’ve been known to have an M&m or two to help us as well! I am a Houston studio newborn photographer specializing in newborn and maternity photography. The studio is located just outside of The Woodlands, TX. The studio is white and bright, perfect for my newborn photography! I’d love to talk with you anytime about scheduling your newborn session. For more details, about newborn session, head over here! Or, if you’re ready to talk, get in touch with me here! You guys, I have been totally into the neutrals for a while, but I’m really loving white lately! The purity of an all white studio for newborns is just so gorgeous! I have been working quietly behind the scenes on a little project that I’m hoping to share soon! Until then… I hope you enjoy a few beautiful newborn portraits in all white set ups! All white studio sessions are simply classic. The neutral tones are pure and perfect for celebrating and capturing your new baby! I choose to use whites, grays, and neutral tones in my studio because it keeps the focus of your newborn portraits on you and your baby! When you view your portraits for the first time, your eyes will be immediately drawn to a sibling kiss on the nose, a snuggle from mom, or a family giggle fest! The best part about shooting an all white newborn session in my studio is that the finished artwork will be easy to hang in your home. You won’t need to worry about matching the pink, purple, or blue in your session to the colors in your home! My whites and neutrals will fit right in! While you’re at it, be sure to book your studio cake smash for the perfect artwork pair! 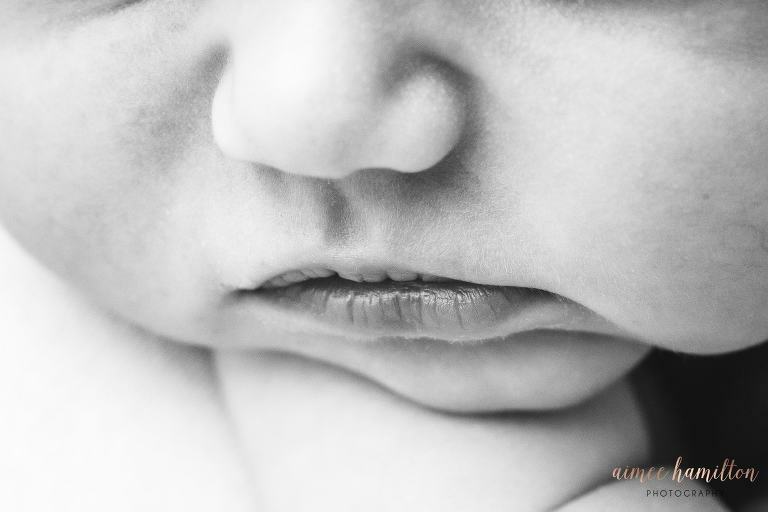 Aimee Hamilton is a newborn and family photographer just north of The Woodlands, TX. For details and pricing on newborn sessions head over to this page. When you’re ready to chat more about your session, feel free to get in touch with me! I’d love to have you come check out my all white studio for newborns! 7 Things I Wish I Had For My First Baby! Are you ready to set up your registry for your sweet baby? I think I scanned everything in Buy Buy Baby! No, really. We thought we needed every little thing in that store! Thankfully, our friends knew better and didn’t buy us twenty adorable pairs of newborn shoes that he would never wear! By the time number three came around, we had our minimal list ready to go! I put together this quick list for you of all the must have baby items for new (and experienced) moms! Must Have Baby Items for All Moms! DockATot– This was actually not something that we had with our first, but was a staple with number 2 and now 3! I’ll admit that our children are worn most of the time and love being held. The DockATot makes them feel as if they are still being snuggled. Instead of getting lost in a crib or even bassinet, the Dockatot is the perfect size for the little guys! Pro Tip: The Dockatot makes transitioning to the crib a breeze! When you’re ready, just move the baby and the Dockatot! They won’t even know they’ve upgraded from the bassinet or mom’s bed! Halo Bassinet- I think we have had a “luxury” purchase with each of our babies. For Aubree, it was the Halo bassinet, but I wish we had it with all three of our babes! The Halo keeps her close by, but also provides a safe space (away from her silly big brothers) during the day! The DockATot fits perfectly inside the Halo! We bought the “Premiere” version with the sounds and vibration but honestly, we haven’t used them like we thought! The simple, bassinet only option would have been perfect for us! Stretchy Wrap- For a squishy newborn, I absolutely love a stretchy wrap! My top choices are the Solly & Happy wraps because they are thin and breathable for the warmer temps in Houston! Our three newborns have been worn from birth in a stretchy wrap! We recently added a blush colored Solly since we have a girl this time! You know I have to have ALL the girly things! Velcro Swaddles- Our first two babies wouldn’t sleep for one second if they weren’t in a tight swaddle! As first time parents, we couldn’t swaddle tight enough. Arms and legs were constantly breaking free, but the final straw was honestly how nervous it made me to have them in a blanket at night. We switched over to the Swaddle Me Swaddles for safety purposes and instantly fell in love! They are so much easier to use and they are safer for night time! Aubree has been a little different than her brothers because she prefers her arms to be free. This time, we are using the Halo Swaddle. She still feels swaddled, but is able to keep her arms out! Zipadee-Zip– When it was time to transition out of the swaddle, I panicked a little. I really thought my kids would never sleep again and I would have to live on coffee! About that time, I discovered the magic of a Zipadee-Zip. These things are incredibly simple, yet so perfect! You have to read for yourself all about how it works! Bonus points– your baby will look like a little starfish! Ha! Sakura Bloom Ring Sling-If you’re looking for the one thing that I never leave the house without– this is it! Ring slings do have a bit of a learning curve, but once you get it down, you’ll love it! One of my favorite things about the sling is that its quick. When I’m in the parking lot at preschool to pick up my oldest, I’m not fiddling with a wrap that takes time. I pop baby in and I’m on my way! Ring slings are also cooler than many wraps because they are made of a breathable linen or silk! My two slings are silk because it will carry baby from the newborn to toddler days and I love the wrinkle free texture! Plus, that shine is unmatched! I’m a big sucker for trying out the latest “it” baby item! I’d love to hear what you’re using and loving! Drop me a comment below so can we all learn about the fun things out there for moms and their babes! It’s been a while since I shared a studio newborn session, so I’m way overdue! 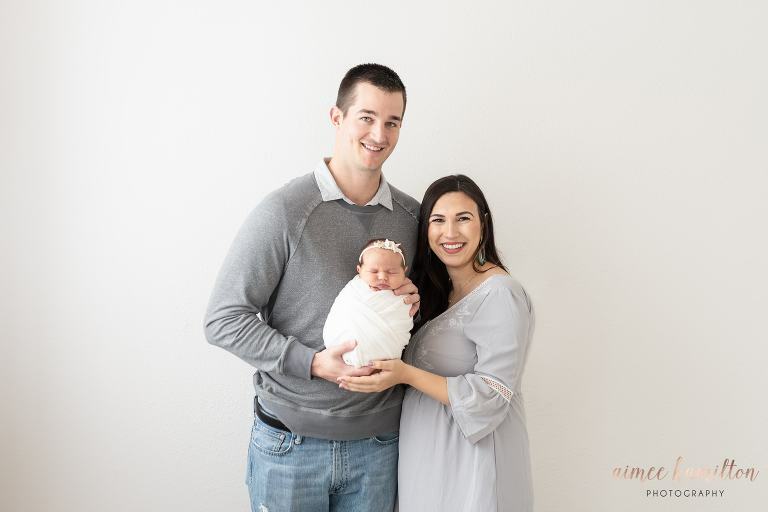 This winter white newborn session was so much fun to shoot. Early on we talked about which session type was best for her family, what to wear, and what her vision was for her session. Christmas was not too far away, so we planned to incorporate a few Christmas elements into her portraits! Mama brought her family to the studio in November for her newborn session. The beautiful white dress that mom is wearing was borrowed from the studio wardrobe that is available to all moms! My signature newborn session always includes family and newborn portraits. I love giving families that first “family of four” image that is always so cherished! I remember being excited for that one shot with both of my boys! There’s just something so special about that first photo! Big brother was so sweet to his sister during his photoshoot! There may have been an M&M or two to help, but hey, I’m not above a good bribe! Fall and winter newborn sessions typically aren’t that different from my normal workflow, but I truly love when a mom asks to incorporate a little bit of Christmas into her studio newborn session. I added some beautiful ivory Christmas trees to my studio collection earlier this year. I was so excited to finally have the opportunity to use them, as well as a few Christmas headbands! For more information about newborn sessions with Aimee Hamilton Photography, get in touch with me here! I’d love to chat with you and help you answer any questions!